Top US and Chinese diplomats have visited Pakistan to meet with the country's new prime minister Mr. Imran Khan within days of his assuming office. The US Secretary of State Mike Pompeo was the first to call on Prime Minister Imran Khan in Islamabad. Pompeo's visit was soon followed by a three-day visit by Chinese Foreign Minister Wang Yi. What is at stake in the battle between China and the United States in Pakistan is the prize of global superpower status, according to the US-based Wall Street Journal. 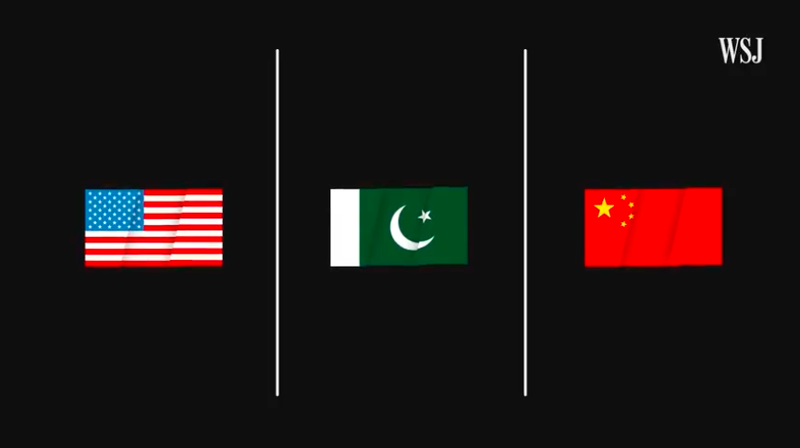 There is a lot of speculation in the western media about the objectives of Pakistan policies being pursued by the two great powers and their impact on the US-China competition for world dominance. Such speculations have centered on the debt related to China-Pakistan Economic Corridor (CPEC) and the US leverage in potential IMF bailout of Pakistan. 1. 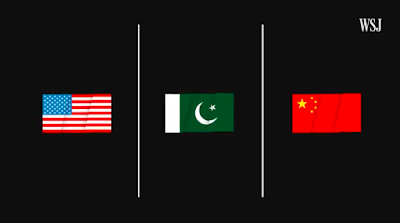 The US-China conflict brewing in Pakistan is about global dominance sought by the two great powers. 2. If China succeeds, it could become the new center of global trade. If the US wins, it could frustrate China's push to become a global power. The impact of it will be felt around the world for decades. 3. China has already surpassed the United States as the world's biggest exporter of goods and services. 4. The biggest project in China's Belt and Road Initiative (BRI) is China-Pakistan Economic Corridor (CPEC) in which China is investing heavily and providing massive loans. 5. China could use the infrastructure built in Pakistan under CPEC to gain access to the Indian Ocean and supplant the United States in Pakistan. 6. CPEC-related spending is sinking Pakistan deeper in debt to China. It could force Pakistan to seek $8 billion to $12 billion bailout by IMF where US is the biggest shareholder with veto power. 7. US does not want the IMF bailout money to be used to repay Chinese debt. Not bailing out Pakistan is not an option because it could cost US an important ally in the region. 8. US could, however, use IMF bailout to limit what Pakistan can borrow from China. Such a condition will achieve the US objective of significantly slowing down CPEC and BRI. 9. Pakistan's dilemma is that it needs both the infrastructure improvements financed by China and the IMF bailout to ease pressure on its dwindling foreign exchange reserves. 10. Whoever wins in Pakistan will become the number one global superpower. The agreement was reached during a meeting in Islamabad between Ning Jizhe, vice-chairman of China’s National Development and Reform Commission, and Pakistan’s Minister for Planning, Development and Reforms Makhdoom Khursro Bakhtiar. In a statement released after the meeting on Sunday, Pakistan’s planning and development ministry said the country had introduced new socioeconomic targets for the project, and agreed to establish a mechanism for third-party participation. On Tuesday, Chinese foreign ministry spokesman Geng Shuang confirmed the decision, saying the two sides would open up the China-Pakistan Economic Corridor to other countries and that it would benefit the whole region. The move is the latest sign of Beijing trying to adjust its approach amid a series of setbacks in countries involved in its “Belt and Road Initiative”. The economic corridor is a flagship project under that strategy, which aims to build a huge trade and infrastructure network spanning Asia, Europe, Africa and Latin America. Pakistan’s Dawn newspaper quoted unnamed sources as saying that Beijing wanted involvement from “countries friendly to both Pakistan and China because it wished to steer clear of adverse criticism, particularly from the US and India”. Zhao Gancheng, director of South Asia Studies at the Shanghai Institutes for International Studies, said the move was an effort to address the backlash over China’s activities in the region. “Inviting a third party will help to ease concerns and the view that there is strategic intent behind the cooperation between China and Pakistan – in particular concerns held by India,” Zhao said. He added that inviting third countries to take part would also help to improve the global standing and recognition of the projects. Sun Shihai, an expert in South Asian studies at the Chinese Academy of Social Sciences, said Beijing was learning lessons from recent setbacks but that overall its global infrastructure push was on track. The US$60 billion Gwadar port deal is one of the projects that has drawn criticism. The US and India see the port project as China seeking to extend its geopolitical influence, while there have been warnings from the International Monetary Fund and others that Chinese infrastructure investments will create a debt trap for Pakistan. On Sunday, Pakistan’s new Prime Minister Imran Khan reaffirmed his country’s commitment to the economic corridor. But the day before, the Financial Times quoted Abdul Razak Dawood – the Pakistani member of cabinet responsible for commerce, textiles, industry and investment – as saying that companies from Pakistan had been put in a “disadvantaged” position. He suggested that Pakistan should “put everything on hold for a year” and even “stretch CPEC out over another five years or so”. Chinese foreign ministry spokesman Geng denied Pakistan was seeking to delay or extend the project, saying “Pakistan-China relations are impregnable and the government’s commitment to the CPEC is unwavering”. The Chinese government has invited Prime Minister Khan to attend the China International Import Expo. Pakistan is the guest of honour at the conference to be attended by members of the Belt and Road Initiative. It added that the joint working groups meetings were planned to be convened in October. There are five working groups: planning, energy, transport, Gwadar and industrial parks. Planning Secretary Zafar Hasan gave an overview of the ongoing projects and rundown of the schedule of the upcoming events, leading to the 8th Joint Cooperation Committee (JCC). The committee – the highest bilateral decision-making body – has planned to hold its 8th meeting in the first week of December in China, declared the planning ministry. The PTI government has undertaken an internal review of CPEC aimed at making it more representative of the aspirations of the people. Also, the Chinese ambassador on Friday met PM’s Adviser on Textile and Industry Razak Dawood. Both the sides agreed to work more closely to build a brighter and prosperous future for the region, according to a statement issued by the minister’s office after the meeting. Meanwhile, the 8th JCC will review progress on the implementation of decisions taken during the 7th JCC that was held in November last year. The officials said progress could not be made on most of the issues that had been decided in the last JCC meeting. At present, 22 projects worth $28.6 billion are under various phases of implementation under CPEC. They include energy projects estimated at $34.8 billion, road projects at $5.8 billion, ML-1 at $9 billion and Gwadar port and city projects. The 7th JCC meeting had agreed to resolve the issue of the revolving fund, which was to be set up to make energy payments to Chinese investors. However, the issue remains unresolved till date. In a related development, the Pakistan Private Infrastructure Board extended the deadlines of a few projects that were falling behind schedule. The deadlines on ML-I project could not be met. Both the sides agreed to finalise the preliminary design of the project by November 2017 that remains outstanding. Progress on four provincial road projects – Mansehra-Muzaffarabad-Mirpur Motorway, Gilgit-Shandur-Chitral Road, Naukundi-Mashkhel-Panjgur Road and Keti Bandar port development – could not be made either. The greater Peshawar Mass Transit Circular Rail and the Quetta Mass Transit projects also remained on papers during the past one year. The resolution of the Gwadar Water supply scheme of five million gallons per day had been declared an urgent priority by the 7th JCC. So far, no tangible progress has been made. Bottlenecks to the construction of 300 megawatts Gwadar coal-fired power plant could not be removed, and Pakistan now wants to address it during the prime minister’s visit. China and Pakistan had also agreed to start construction on the New Gwadar International Airport within six months of signing of the implementation agreement. But work on the project has yet to be started. However, a Chinese delegation is expected to visit Pakistan soon to discuss the airport project, the officials said. Similarly, four out of nine prioritised Special Economic Zones have also remained stuck for the past one year. Military ties between China and Pakistan are the “backbone” of relations between the two countries, a senior Chinese general told Pakistan’s visiting army chief, days after a Pakistani minister stirred unease about Chinese Silk Road projects. General Qamar Javed Bajwa is the most senior Pakistani figure to visit ally China since the new government of Prime Minister Imran Khan took office in August, and his trip comes a week or so after a senior Chinese diplomat visited Islamabad. Bajwa may be hoping to smooth out any Chinese alarm at comments last week by Pakistan’s commerce minister, Abdul Razak Dawood, who suggested suspending for a year projects in the China-Pakistan Economic Corridor, the Pakistan leg of China’s Belt and Road Initiative that includes recreating the old Silk Road trading route. On Tuesday, Zhang Youxia, a deputy chairman of China’s powerful Central Military Commission which President Xi Jinping heads, reiterated to Bajwa that the two countries are “all weather” strategic cooperative partners. “China-Pakistan military ties are an important backbone of relations between the two countries,” said Zhang according to a statement by China’s Defence Ministry late on Tuesday. However, Zhang cited Xi as saying that the Belt and Road initiative should be a benchmark for China-Pakistan ties. He said China appreciated the new Pakistan government’s platform of fully promoting the relationship and that China was willing to work with the new government to push construction of the China-Pakistan Economic Corridor. Martin Sandbu rightly warns about the diminishing role of the IMF as a crisis manager ( Free Lunch, September 19). The challenges faced by the fund are much bigger than its lack of financial resources to put out fires. The current financial market turmoil in Argentina shows the IMF’s standby loan of $50bn — the largest ever credit line in IMF history — has failed to provide an effective anchor for addressing financial vulnerabilities and bolstering market confidence. The immediate disbursement of $15bn (30 per cent of the total IMF loan) to Argentina did not help in averting currency collapse or arresting capital flight. These developments in Argentina may deter other emerging market economies to seek financial support from the IMF as its ability to provide the missing anchor for financial stability has been seriously undermined. In the aftermath of the global financial crisis, new bilateral and regional mechanisms for crisis management have emerged, but they have remained largely untested. Hence, there is a need to implement quota and voice reforms at the IMF to better reflect the new economic landscape. In addition, the IMF should move away from the orthodoxy in terms of economic thinking and adopt a more nuanced approach towards capital controls that have proved to be effective tools in curbing capital outflows. "Not helpful" was then-commissioner Olli Rehn's reaction a few years ago when the International Monetary Fund realised - and duly publicised - that it had underestimated the harm fiscal austerity inflicted on growth. The rest of us may beg to differ: it's a good thing when a large economic research and policy institution improves our knowledge and even better if policies improve as a result. The implication of the new take on fiscal multipliers was that the eurozone and the IMF had made the recession worse by overdoing the fiscal belt-tightening. The IMF is being helpfully unhelpful again. There is a lot of interesting stuff in the fund's World Economic Outlook, in particular its Chapter 3, which analyses the worldwide fall in productivity growth. But the most interesting bits were only hinted at in chief economist Olivier Blanchard's presentation on Tuesday. A blog post by Francesco Saraceno proves that it pays to read until the end of the WEO Chapter 3. Tucked away in the last pages (Box 3.5, p104), is a short study on how productivity is affected by structural reforms. To point out the obvious, this is particularly relevant to the eurozone, where structural reforms are imposed on the weakest members, bought from stronger countries in return for extended deadlines on deficit reduction, and insisted on by the ECB as the counterpart for its doing the monetary heavy lifting. So you might think Europeans would be particularly keen to find out if reforms achieved their promise. I'll write that again. Product market liberalisation is good for productivity in the long run but costly in the short run. Labour market deregulation shows only bad effects on productivity. Blanchard's euphemism is that "structural reforms are no miracle cure - the effects are very often uncertain". Indeed. You might think that in a rational world, better knowledge about what works and what doesn't would inform policy decisions and help us move on from the generic call for "reform". You might even hope that it would inform the current stand-off in Greece, whose government says it is keen to weaken product market monopolies but undo some of the labour market reforms (on collective bargaining and minimum wages) enforced by creditors. Any plots to sow discord in China's ties with Pakistan will not prevail, the Chinese government's top diplomat said on Tuesday, as Beijing fends off criticism of its economic projects in Pakistan and a clampdown in China's western Xinjiang region. China has pledged US$57 billion (£43 billion) to build power stations, major highways, new railways and high capacity ports along the China-Pakistan Economic Corridor, a key part of Chinese President Xi Jinping's Belt and Road plan to further tie China to Eurasia. The sustainability of Chinese projects has come under fresh scrutiny in recent months, as U.S. Secretary of State Mike Pompeo in July warned that any potential International Monetary Fund bailout for Pakistan's troubled economy should not be used to pay off Chinese lenders. Both Beijing and Islamabad say the loans are sustainable. China welcomes the good start made in its "all-weather" partnership with Pakistan following the election of the new government under Prime Minister Imran Khan, State Councillor Wang Yi told Pakistan Foreign Minister Shah Mehmood Qureshi on the sidelines of the U.N. General Assembly in New York. But "any conspiracies attempting to incite disharmony or interfere in China-Pakistan relations will not prevail," Wang added, without elaborating, according to a statement released by China's foreign ministry on Wednesday. China and Pakistan should continue to make "all-out" efforts to promote the economic corridor, expand trade and reduce poverty to bring more benefits to the ordinary people of Pakistan, Wang said. The relationship between China and Pakistan will not change, regardless of circumstantial changes, Qureshi told Wang, according to China's statement. The corridor is "extremely important" to Pakistan and has brought "deep impact" for jobs, development and livelihood, and Islamabad will take effective measures to ensure the security of the entire route, he added. Beijing has faced growing international criticism from rights groups, some western nations and United Nations human rights experts over its sweeping security crackdown in the far western region of Xinjiang, which borders Pakistan. Islamabad, like most governments of majority Muslim countries, has so far remained silent on the issue, but a group of Pakistani businessmen whose Chinese wives and children have been trapped in Xinjiang are lobbying the new government to help pressure Beijing into allowing their release. Beijing says it faces a serious threat from Islamist militants and separatists in Xinjiang and has rejected accusations of mistreatment. Pakistan and Russia signed a deal on Thursday for conducting feasibility study on a planned $10-billion offshore gas pipeline, an idea coined by Moscow to capture the energy market of Pakistan. Ministry of Energy (Petroleum Division) Additional Secretary Sher Afgan and Deputy Energy Minister of Russia Anatoly Yanovsky signed a memorandum of understanding (MoU) for undertaking the study. Inter State Gas Systems (ISGS) Managing Director Mobin Saulat was also present at the ceremony. On the occasion, the two sides expressed interest in enhancing bilateral relations in the energy sector. ISGS – a state-owned Pakistani company established to handle gas import projects which is already working on schemes like the Turkmenistan-Afghanistan-Pakistan-India (Tapi) gas pipeline – has been designated by Pakistan for executing the pipeline project along with Russia’s energy giant Gazprom. Gazprom will conduct the feasibility study and bear its expenses in order to assess economic viability and cost of the project. The China-Pakistan Economic Corridor (CPEC) has now entered the industrialisation phase and needs gas for duty and tax-free Special Economic Zones (SEZs). The offshore gas pipeline will meet energy needs of the industries being set up in the SEZs along the CPEC route. According to officials, the pipeline will connect Pakistan and Russia and act as an energy corridor between the two countries. Owing to a long-running tussle with Europe and the US over the annexation of Ukrainian region of Crimea, Russia is looking for alternative markets and wants to capitalise on increasing energy demand in South Asia. The 392-kilometer Sukkur-Multan section of Peshawar-Karachi Motorway is likely to be opened for traffic by May next year, two months ahead of the given schedule of August 04, 2019, General Manager of the project, Arbab Ali said. ‘At present 69 percent of total work has been completed, out of which 392 kilometer roadbed and culvert passage, and other structures are about to be competed (99%). Up to now, all the bridges are near completion, and asphalt pavement works are advancing at full speed, and the building construction and ancillary works also being implemented actively,’ he said while talking to a group of media in Multan. He said this section was part of the mega China Pakistan Economic Corridor (CPEC) project. He informed that on May 26 this year, a 33 km section (Multan-Shujaabad) in the north end of the project was inaugurated by then Prime Minister Shahid Khaqan Abbasi, however it could not be opened to traffic due to incomplete work of the section. ‘This section will be opened to traffic by March next year’. Pakistan’s PKM project starts from Karachi via Hyderabad, Sukkur, Multan, Islamabad, Lahore and other cities ends in Peshawar with a total length of 1,152 kilometers. Sukkur-Multan has a design speed of 120 km per hour, and it is a two-way six-lane road with a contractual value of USD 2.889 billion (excluding $180 million tax exemption). The Export-Import Bank of China provides loan support, and China State Construction Company Limited (CSCEC) is responsible for construction on Engineering Procurement Construction (EPC) basis. With a contract period of 36 months (including design period of four months), the project officially started on August 5, 2016.